This grizzly bear was becoming annoyed with her second year cubs. She was in the holding pool directly below our viewing platform trying to catch salmon but the cubs were not giving her enough room to work. 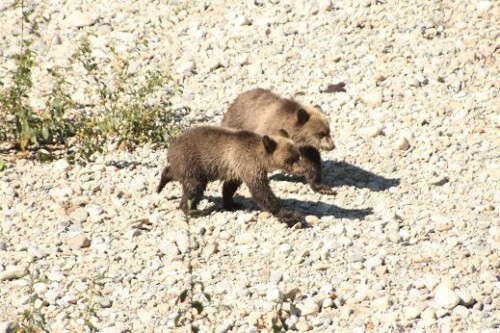 A couple of “growls” and the cubs moved off and mom was successful and able to share her catch. 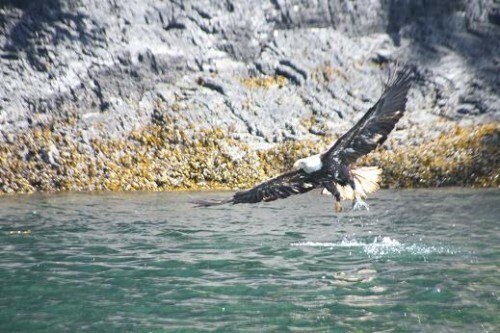 Always a challenge to get a good picture of an eagle coming down to pick a fish out of the water. Even rarer to get a picture of a successful eagle with a small fish in it’s claws. 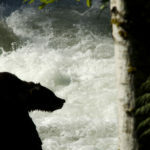 Glen (one to the guides at Grizzly Bear Lodge) has developed that skill to a high level and provides another good photo. 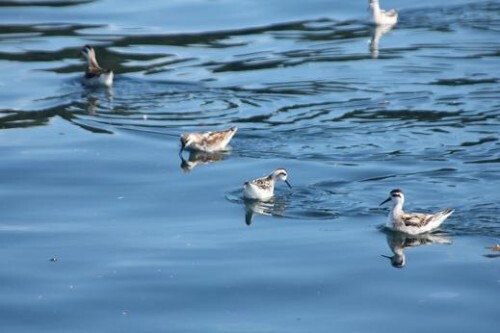 Phalaropes are the only shorebirds that regularly swim in deep water. Every year in late summer, migrating Wilson’s Phalaropes put on an amazing show as enormous flocks pass through our area. There they spin round and round in the nutrient-rich waters, creating whirlpools that stir up invertebrates that will fuel their migration to South America. The flocks of birds dart about as if following a choreographed programmed flight. And yes many of the “birders” that visit Grizzly Bear Lodge want pictures. The most popular theory is that orca eye-spots protect their actual eyes by providing a false target (prey animals will often attack the eyes of their predators). But then if they did not have the eye patch it wouldn’t it be harder to find the eyes? 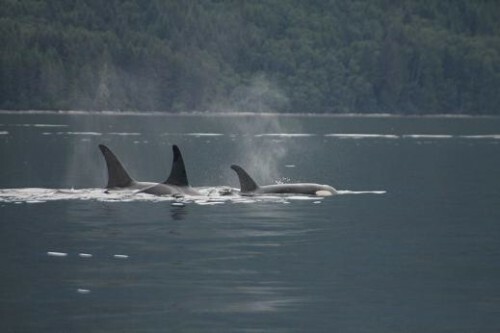 Some scientists believe that the eye-spots might help other orca recognize body orientation in dark or murky water. The reason is not the important part but the fact that lodge guests want pictures of the orca’s eye spot as they surface is important. It is harder than one might expect as orca do not give much of a warning when they plan to surface. 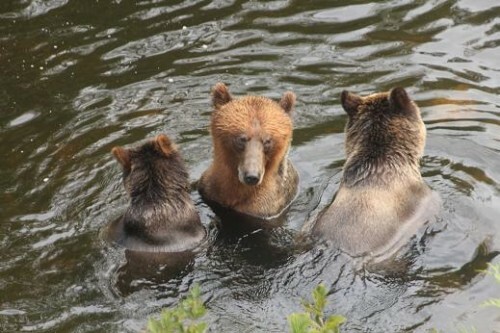 First year grizzly cubs are not overly fond of getting wet. They are often viewed sitting on logs on the river bank, on rocks in the middle of a fishing hole or slowly following their mother. 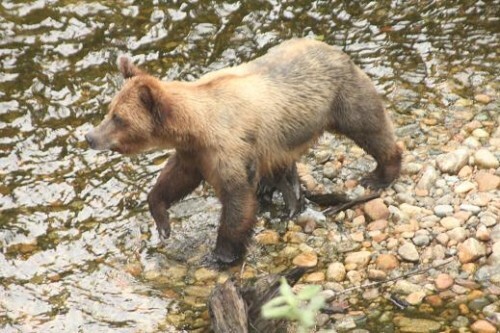 This mother plans to go fishing in the deeper part of the river which means the cubs will need to swim if they want their share of the catch. Few seaplanes seat eight guest comfortably so we normally have two planes bring guests into Grizzly Bear Lodge from Campbell River. This also provides us with room for the “always” necessary groceries. As you can see there are groceries from the first plane stacked near the end of the dock and luggage waiting with guests to be placed on the second plane that is nearing the dock. For many of the guests this is their first experience flying in a float plane and the reviews are mixed but I would say they are overwhelmingly positive. This is the case when grizzly bears respect each others comfort zone. The head in the lower right corner belongs to a very large female which is not a threat to the mother and cubs but they still have their own fishing areas. 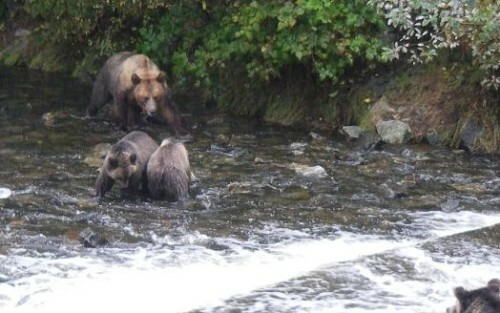 The single grizzly dominated the better fishing area near the entrance to the spawning channel while the mother and cubs caught all the salmon they needed a little lower on the river. 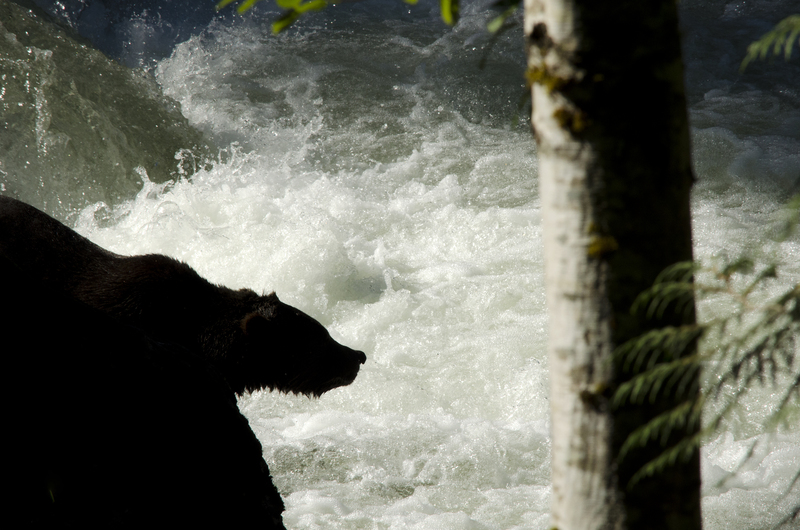 The abundance of salmon in this area means there is little need to fight and therefore less chance of an injury that could reduce the ability to catch salmon. It is all about fattening for hibernation and fighting is counter productive. “The coat of an individual bear may change colour during the year, with the new coat in summer a dark rich brown, while the worn coat becomes tawny or reddish brown. The winter fur is thicker and coarser than the summer fur and appears shaggy. During summer the old inner fur and guard hairs are shed; by autumn there is a fully developed coat, with guard hairs about 10 cm long, underfur about 8 cm long.” This explains the coat on this bear which appears to be in transition form a summer to winter coat. 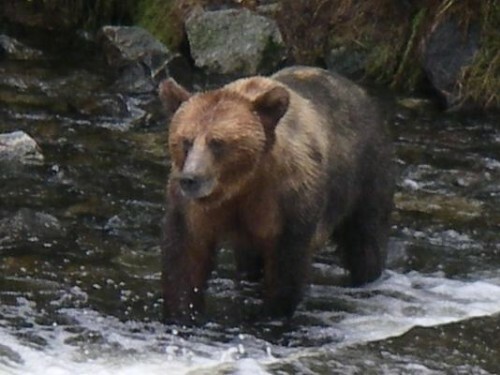 In our grizzly viewing area we have notice that the coats will darken after the grizzlies have been feeding on the oil rich salmon.